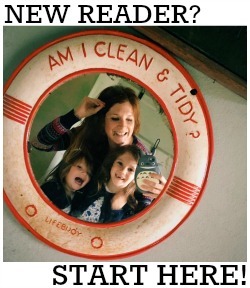 Last week the girls and I spent a lovely couple of days up in London with the RocknRoller Baby gang. We stayed overnight at the Novotel at Paddington, went to the L.O.L Surprise launch party at Westfield and spent an afternoon at Ripleys Believe It Or Not! Then we finished off our trip in best possible way we could; with dinner at the one and only Planet Hollywood. 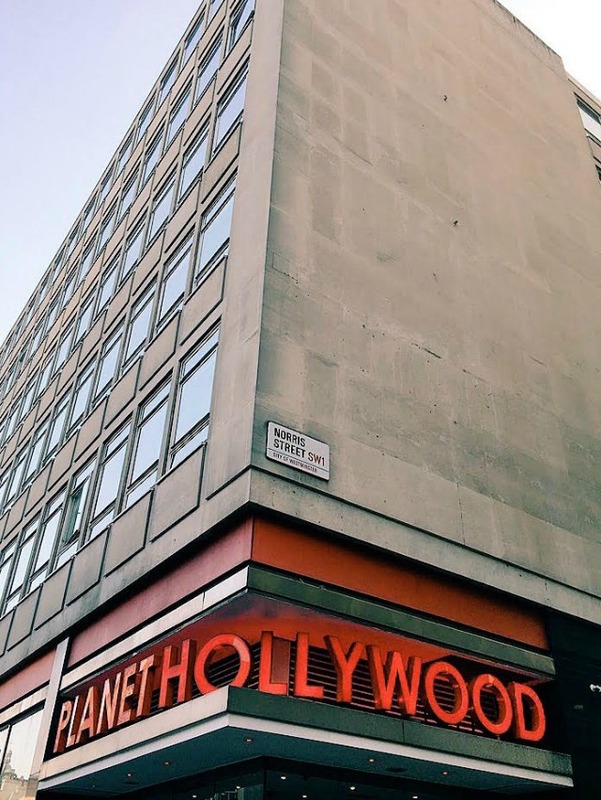 I can remember the original Planet Hollywood opening in London like it was yesterday. In actual fact it was 1993; the restaurant was in the Trocadero and the chain had the backing of huge celebrities of the time like Bruce Willis and Demi Moore, Arnold Schwarzenegger and Sylvester Stallone. I was a teenager and it was the place to go and to be seen, and as proof of your visit (there was no such thing as social media back then) it was all the rage to commemorate your meal with a trip to the gift shop, where they sold baseball caps, tees, sweaters, EVERYTHING YOU COULD POSSIBLY WANT, emblazoned with that world famous logo. I never did get to dine at the restaurant which was torture enough, but I also can't tell you how desperate I was for one of their sweaters! Fast forward twenty four years and the chain is going from strength to strength. So much so in fact that Bookatable has just voted it the no.1 child friendly restaurant in London for the THIRD YEAR RUNNING. And after our amazing experience I can completely see why! The restaurant has now moved to a bigger and better site on Haymarket, just down the road from the original venue. As you enter, there is a large cocktail bar to the left, and the restaurant is straight ahead of you, jam packed full of movie memorabilia and divided up into lots of themed areas, like the Bond room and the British room. Ruth, the kids and I arrived at 4pm and were greeted by lovely hostesses who took us to our table. It took us forever to decide what to eat, not just because the menu was so brilliant and extensive and we couldn't make up our minds, but also because we were all in awe of everything that was going on around us. The memorabilia, the messaging screens (you can send your own messages via text), the singing and dancing and the looking out for yourself on the telly (yes really! Cameras scan the room and beam live video footage of diners to the big screens - and you're encouraged to dance and wave and show everyone just how much fun you're having when the camera is on you!) is all utterly brilliant. We enjoyed taking it all in so much we had to ask our waitress to 'give us a couple of minutes' about five times! As we couldn't make our minds up about the starters, and we were starting to feel peckish after seeing so many delicious looking meals being delivered to the tables around us, we decided to go for two of the VIP sharing platters to start, so that we could sample a range of Planet Hollywood's famous appetisers. 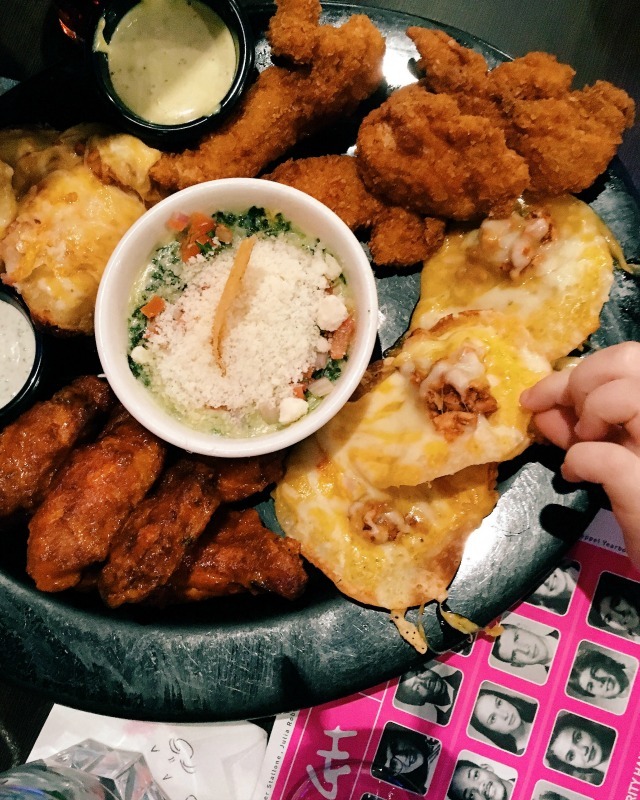 That was definitely a good choice and between the six of us we demolished two plates of buffalo wings, texas tostadas, chicken crunch, loaded potato skins and, everyones absolute favourite, tortilla chips with a parmesan spinach dip! I've said it once, but I'll say it again: the menu really is incredible. There is something for everyone, from traditional American burgers, hot dogs, steaks and ribs, to wok fired Asian stir fries, pizza and pasta, salads and an entire gluten free menu too. Plus of course there is a children's menu, which is £9.25, and consists of a main and a dessert, and unlimited sodas to boot. That was the first thing that really surprised me about Planet Hollywood. 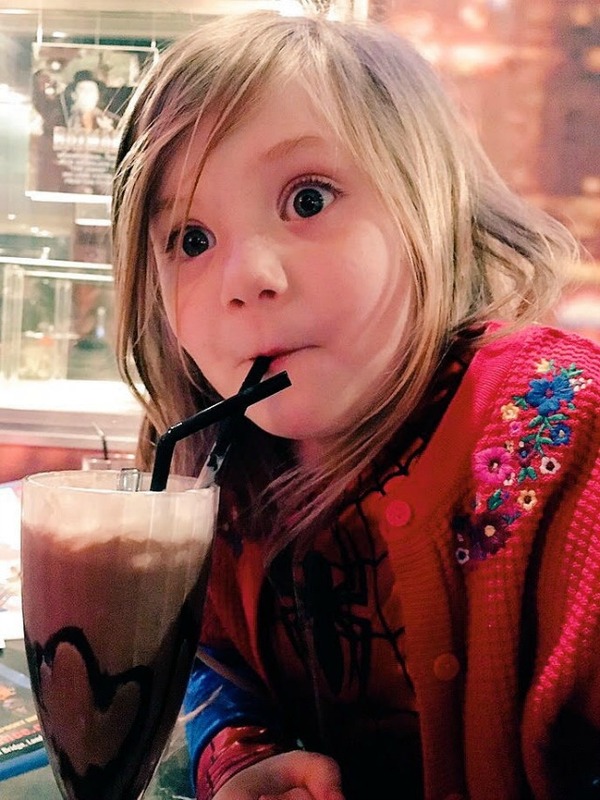 As it's so famous, and a tourist hotspot in the heart of the West End of London, I expected it to be on the expensive side but in actual fact prices were incredibly reasonable - and the whole experience was SO much more fun than any other 'family friendly' restaurant we've ever been to! For our main courses, I chose the crispy chilli beef (it was SO good), while Daisy ordered a margherita pizza from the adult menu and Evie the mac & cheese from the kids menu. Over on the other side of the table, Ruth had the chicken chow mein, Jimmy had a pepperoni pizza and Florence had a special half portion of the ribs, which she said were the best she'd ever tasted! After demolishing our first two courses, we needed a little break, so we left our table and did the conga to the gift shop! After picking out some awesome merchandise we headed back to place our orders for dessert. The dessert menu was amazing. Jam packed full of knickerbockerglories and sundaes and pancakes and coke floats and cheesecakes and milkshakes, we had almost as much trouble deciding on what to go for as we'd had when ordering our starters and mains! Once our bellies were completely full and the time came for us all to part ways and head back home, we realised we'd been in the restaurant for the best part of four hours! Have you ever been for a meal with children that has lasted that long? Me neither! It just goes to show how family friendly Planet Hollywood really is. You can talk loudly, dance, sing, whatever you like, so long as you have a great time. And I think it's pretty obvious that we did just that! Our top tips for visiting? Book in advance, just in case. The restaurant is incredibly busy, especially at peak times (12-2pm and 5-8pm), weekends and in the school holidays. 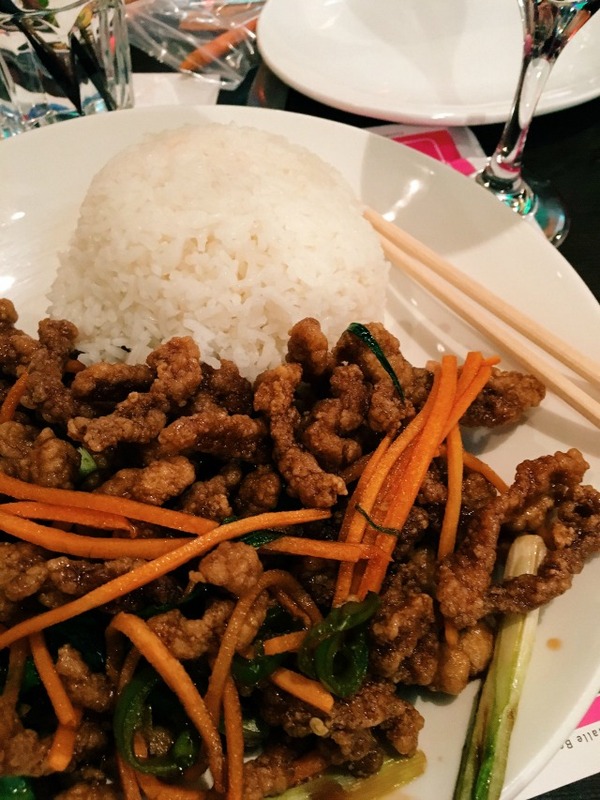 Allow yourself plenty of time to dine! You won't want to rush a meal at this amazing place! 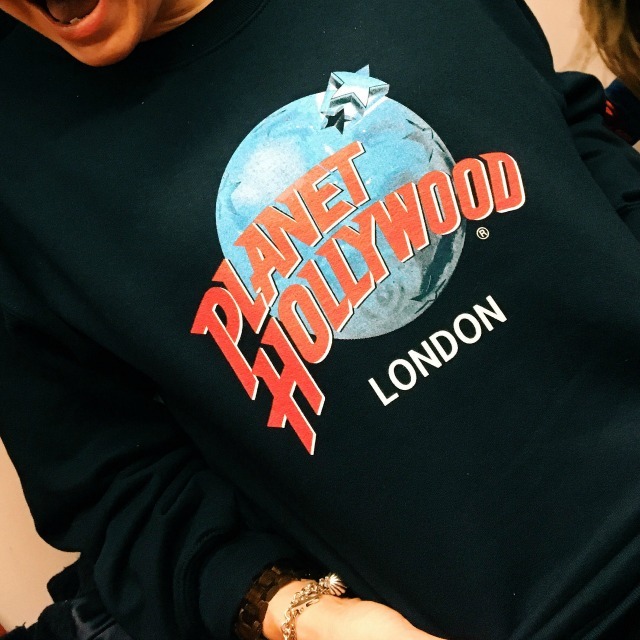 ps I finally got my mitts on a Planet Hollywood sweater! And I LOVE it! 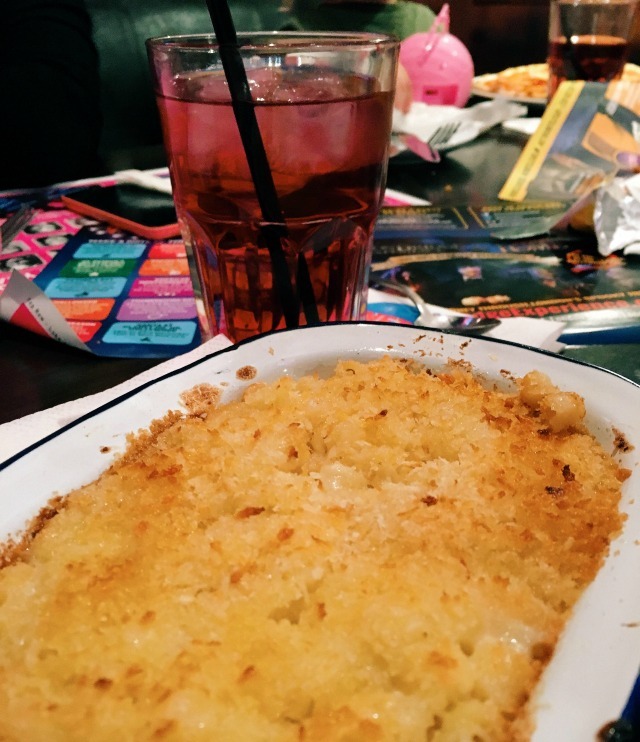 We received a complimentary meal at Planet Hollywood in order to write this honest review. Special thanks to Esther, Tony and Rosaria for looking after us so well!